The 2013 Nissan LEAF receives a new entry-level “S” trim, a new onboard charger to halve charging times, and multiple energy efficiency improvements related to aerodynamics, regenerative braking, and energy management. Efficiency is the theme for the 2013 Nissan LEAF and this carries over to the exterior. Its shape is optimized for aerodynamic efficiency, including the contoured taillights, ultra-lightweight alloy wheels wrapped in low-rolling-resistance tires, and headlight fins that direct air away from the side mirrors. All of these optimizations also have the bonus side effect of reducing wind noise while inside the car. 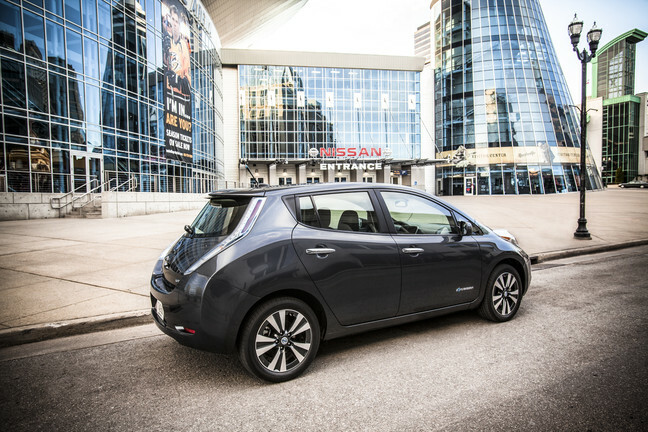 The 2013 Nissan LEAF delivers a surprising kick for a car designed to be economical. The 24 kWh lithium-ion battery pack is mounted beneath the floor to deliver the juice to an 80 kW/107 horsepower motor at the front. That motor instantaneously produces 207 pound-feet of torque from zero RPM—something only an electric car can boast. Top speed is estimated at 90 mph—not the most amazing number, but definitely not disappointing by any means unless you’re taking your LEAF out to a track, but we don’t know why anyone would do that. The 2013 Nissan LEAF will go about 75 miles on a full charge, which Nissan claims will cost about $3.00. The U.S. Environmental Protection Agency says the LEAF uses approximately 29 kWh per 100 miles driven, which gives us an energy efficiency equivalent rating, or MPGe, of 129 mpg city/102 mpg highway and 115 mpg combined. Yes, you read that right. Those are real numbers. The battery’s placement at the bottom of the car would normally reduce headroom in the 2013 Nissan LEAF interior, but Nissan has taken care to raise the cabin to compensate for that issue so that even taller folk can sit comfortably both in front and at the back. The seat upholstery is not only tasteful but crafted from recycled materials to further reduce the LEAF’s environmental footprint. At the front, an easy-to-use touchscreen navigation system and instrument cluster make the interior look almost futuristic. The 2013 Nissan LEAF delivers higher-than-average safety with 5 out of 5 stars in government crash tests as well as the highest rating of “Good” in the Insurance Institute for Highway Safety’s front, side, and roof tests. It comes standard with antilock disc brakes, stability and traction control, front side and side curtain airbags, and an optional rearview camera.